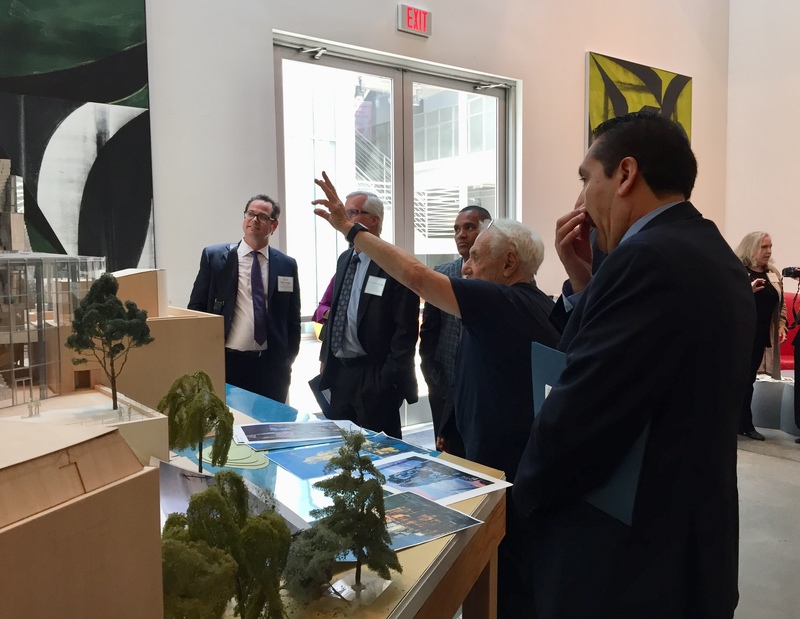 Architect Frank Gehry hosts administrators from across California to share lessons learned. Distributing leadership throughout the school, allowing schools the flexibility to use practices that might go “outside the lines,” and sometimes replacing principals and reluctant staff members are a few of the strategies district and school leaders say they are using to implement arts-focused school improvement models. Gathering Monday at renowned architect Frank Gehry’s studio in Los Angeles, district and school administrators participating in Turnaround Arts: California — part of the larger Turnaround Arts organization — discussed many of the challenges they have faced in using the arts as a vehicle for raising student achievement and increasing engagement. The event brought together leaders from districts that are new to the program, as well as those who have been participating for a few years and are looking to share their experiences with other schools. With the Every Student Succeeds Act providing new opportunities for schools to increase arts instruction as part of a “well-rounded education,” the event provided some lessons that can benefit other school leaders. Created in 2011 as part of President Barack Obama’s Committee on the Arts and the Humanities, Turnaround Arts is now run by the Kennedy Center and includes 73 schools in 17 states and the District of Columbia. The organization provides the schools with professional development, access to instruments or other resources, and connections with local partners that can support arts instruction and integration into the curriculum. Professional artists from a variety of areas also work as mentors to individual schools. Gehry, whose designs include Walt Disney Concert Hall in downtown Los Angeles and Guggenheim Bilbao in Spain, co-founded and continues to support Turnaround Arts: California. Just last month, he donated $1 million to help the program expand throughout the state. He also serves as a mentor to Hoopa Valley Elementary located on the Hoopa Indian Reservation in Humboldt County. For students, “creativity seems to get turned off at some point,” he told the attendees, adding that he’s interested in finding what can keep students inspired beyond the early elementary grades. Steve Seidel, the director of the Arts in Education program at Harvard University, added that inspiration is a misunderstood part of learning and that students need to have role models who are experts in their craft as well as those who are “just out there” and can demonstrate for students what they can achieve in another year if they persevere. Diffenbaugh emphasized the importance of including the community in arts integration. A former K-8 school, the MPUSD’s Martin Luther King Jr. Elementary School uses its extra space as a community arts wing with the agreement that artists will use their talents to support instruction at the school. He added that these partnerships are an important way to sustain arts integration once outside funding ends — another predominant theme of the discussion. Seidel added that it has “tremendous meaning” for students when adults in the community want to come into their schools, adding that the arts are a way to make schools more physically appealing and beautiful places to learn. Edward Winchester, the executive director of secondary education for the Santa Ana Unified School District, said he’s usually in a position of telling school leaders that they have to “stay inside the lines,” but for arts integration to be successful, school leaders often need to be able to “go outside the lines.” Working with Amy Scruton, principal of Willard Intermediate School, he said he’s learned that what works for other middle schools might not work for hers. Daniel Wright, acting superintendent of Stockton Unified School District, added that it’s about giving school leaders the freedom to make “new lines.” He added that including the arts in California’s new accountability system under ESSA would be another way to maintain a focus on their role in supporting academics. And Jon Ray, superintendent of the Klamath-Trinity Joint Unified School District in Humboldt County, talked about how creating a team of instructional specialists focused on arts-integration strategies created a type of “peer accountability” and allowed the program to be sustained in spite of frequent principal turnover. Architect Frank Gehry describes a model at his Los Angeles studio. Malissa Shriver, the executive director of Turnaround Arts: California, asked the administrators what type of support they need from the organization. Broadening the range of arts-related partner organizations that can work with schools would be helpful, suggested Virginia Lee, the director of family and community engagement with the Partnership for Los Angeles Schools, which has one Turnaround Arts site. Several participants also said opening up the organization’s summer retreat in Virginia to more educators from the schools would also help them spread the learning among their staff members.